THE HAGUE - The Curaçao Parliamentary delegation stands no chance at having a meeting with the Kingdom Council of Ministers to discuss the National Decree to dissolve the Parliament and to convene elections on April 28. The Kingdom Government will not annul the decree. 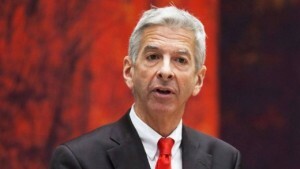 Dutch Minister of Home Affairs and Kingdom Relations Ronald Plasterk announced on Friday, following a meeting of the Kingdom Council of Ministers, that he received the green light to send a letter to Willemstad that same day to inform the Curaçao Parliament that there would be no meeting with the Kingdom Government and that the petition by the Curaçao Parliament had been put aside. Plasterk told media representatives that not only was it constitutionally impossible for a delegation of the Curaçao Parliament to participate in a meeting of the Kingdom Council of Ministers, but that a fundamental, substantive reason for having such a meeting was also lacking. In his letter of Friday, in reply to the petition that Chairman of the Curaçao Parliament Gilmar Pisas had filed to the Kingdom Government, Plasterk stated that “there was no reason to doubt the validity” of the National Decree to dissolve the Parliament. “The termination of the confidence in the Koeiman cabinet by one of the coalition partners has resulted in the loss of the support of a majority in Parliament. The Curaçao Government in such cases has, based on the Curaçao Constitution, the authority to dissolve the Parliament,” Plasterk stated. “The Kingdom Government is not of the opinion that the decision is in violation of international treaty obligations, the Kingdom Charter, a Kingdom Law or a General Measure of the Kingdom Government, or with the interests of which the securing is a matter of the Kingdom. According to the Kingdom Government, the Governor has rightfully ratified the decree,” the Minister stated. Plasterk said that naturally he remained available to sit down with the Curaçao delegation. He said that as Minister of Home Affairs and Kingdom Relations he was always willing to meet with Dutch Caribbean representatives. However, that is not what the new majority in Parliament, also referred to in the media as “the group of twelve,” wants. The delegation comprising Pisas and the leaders of the MFK, KdNT, PS and MP parties, along with the independent members Eduard Braam and Gassan Dannawi, wants a meeting with the Kingdom Council of Ministers. The adopted motion of March 3 by the Curaçao Parliament authorises a delegation led by Pisas to move the Kingdom Council of Ministers to annul the National Decree to dissolve the Parliament in an effort to stop the April 28 elections. Plasterk was reluctant to discuss the results of Dutch elections and the massive loss of his party, the Labour Party PvdA when he was asked about this by the media. Calling the loss of 29 seats in the Second Chamber an “enormous blow,” he said that the trend on the islands was the same as in the Netherlands.